There is definitely a need for more GF recipes – I make Irish Soda Bread – and it is in much demand by friends who would rather have than dessert! Look forward to more. The more recipes I try to convert, the more I try to post. We all need to learn from each other to make the best tasting GF food. 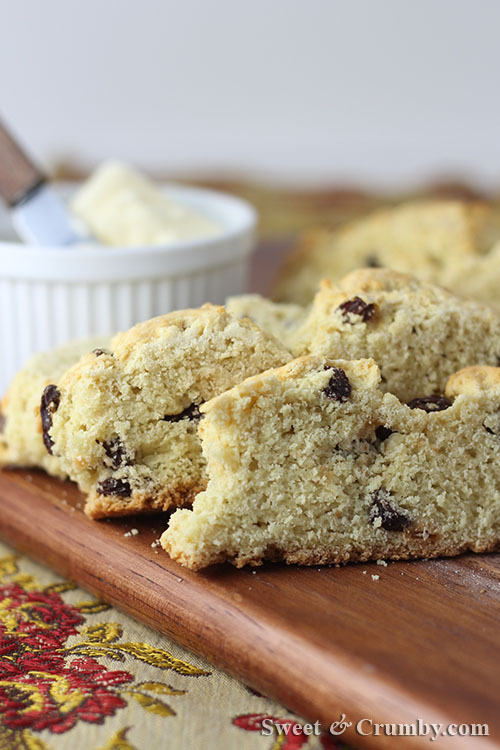 I do like Irish Soda Bread better than many desserts. It is popular here too. Thank you! Happy St. Patrick’s Day! I made your Irish Whiskey Bread Pudding for my blog today (with lots of links back to you, of course!). Everyone at work is raving! I am sure you enjoyed your celebration with your family with such tasty looking bread on hand. I did. Thank you Colline. love your gf version. It looks delicious and so soft and the texture looks perfect! I was pretty amazed that it was an exact replica to my other non gf version. Usually, I can taste some difference but his particular bread did unusually well with the substitutions. Thanks Jessica! There are Leprechauns with gluten issues singing your praises, Geni, all over the world. I bet both breads are delicious! I’ve no issues with gluten but know those who do. I’ll certainly be passing your recipe along. Thank you. Great post! Thanks for the side by side pics and recipes! How lucky are we not one but two recipes. Of course I want to try your gluten free version.